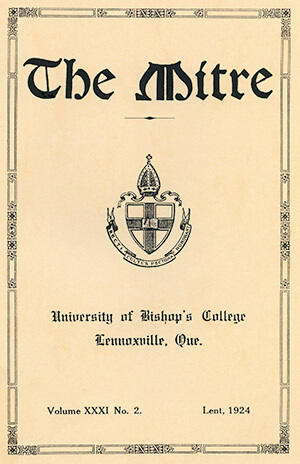 The Mitre, Canada’s oldest student literary journal is published at Bishop’s University, Lennoxville, Quebec. Since 1893 and for a span of almost 60 years, it served as the sole vehicle for the sharing of campus news, alumni updates, sports accounts, opinion pieces, historical essays, photographs and much more – an invaluable source of information providing a broad perspective of life at Bishop’s and Lennoxville during this time period. As such, it also featured accounts from the war front via student letters sent to the journal. With the launching of publications such as The Campus newspaper (1944), and the Alumni Newsletter (1957), The Mitre eventually evolved into a creative arts magazine, featuring short stories, poetry, plays, photography and art works. Contributors include the university community: faculty, staff, students, alumni and friends of Bishop’s University.